When the Kemptville Jr “A’s” participated in junior and senior tournaments, they played against teams from across Ontario, Quebec and the United States. Many times the Junior “A’s” were entered into intermediate and senior tournaments as a challenge for the team and as a way to play ball at a very high caliber. Kemptville was only a community of about 2,000 people and in league play tournaments the team successfully defeated many larger entries. A great deal of dedication, energy and determination were invested into putting together this team and preparing them for the 1975-76 seasons. They were Junior A finalists in Inter-Provincial League Championships and also in the Ontario Amateur Softball Association Play Downs in 1975. 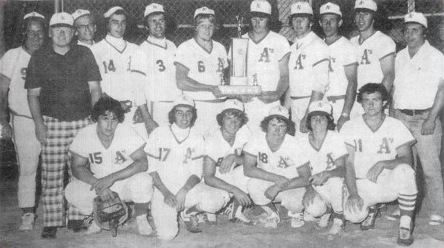 In 1976, they were the Junior A winners of the Inter-Provincial League Championship and finalists in the Ontario Amateur Softball Association Tournament. Many of the players in the Kemptville Junior “A’s” moved on to higher competitive levels in softball, an indication of the quality of ball players on the team. Pitchers were recognized as the top of the field in both Ontario and Canada. Players went on to represent Canada at World Championships. The Kemptville Junior “A’s” was a team that was recognized in a positive light in the community. When the “A’s” played the bleachers had to be carried from all the ball diamonds to accommodate the fans. This strong community and business support for the “A’s” built a strong foundation and support for amateur sports in our community.